Featuring heavy-duty construction and design features resulting from over 50 years of experience in specialized soil cultivation equipment design. The RIDGE LEVELER provides superior field smoothing for your chisel plowing operation. This unit fully or partially levels your field for second pass operations as well as allowing you to spread manure on a frozen field after freeze-up. The RIDGE-LEVELER has been designed to mount on your chisel plow using specially constructed universal brackets and, once set, raises and lowers with the chisel plow. The RIDGE-LEVELER features a two step leveling process, with the toolbar beginning the leveling, and the blades following to move suspended soil back into the grooves. 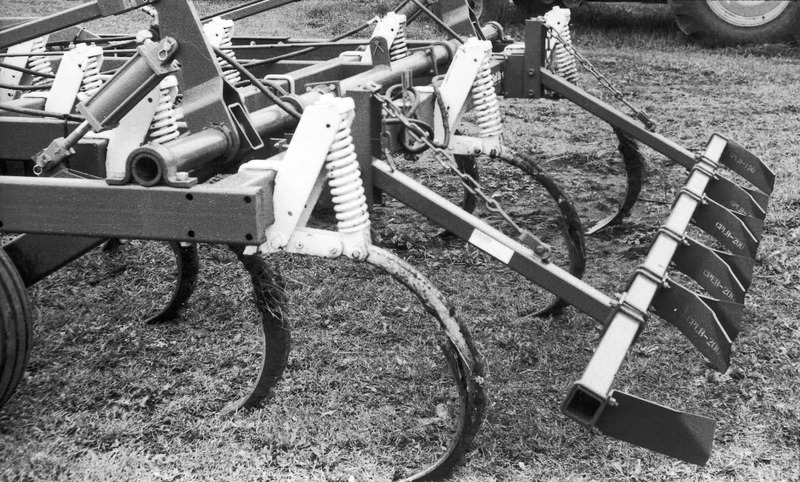 The RIDGE-LEVELER increases your efficiency in applying Anhydrous Ammonia by sealing the soil immediately after the last row of chisels for maximum retention of Anhydrous in the soil. The RIDGE LEVELER comes in any width to fit your needs. If your chisel plow is over 12 feet wide, and used under hilly or uneven conditions, you may want to use 2 pairs of arms and a split tool bar application to allow some independent movement of the 2 sections of leveling system. This will provide maximum leveling under even the most extreme conditions.